I love my best friend a lot. She called this week and left me a voicemail. On a Monday, that is cruel and unusual punishment! That kind of torture is right up there with living 27 years on planet earth without ever having had pimento cheese. Yeah, I know. Insanity. There’s no going wrong with pimentos or cheese, and together…it’s like peanut butter and jelly…peas and carrots. Meant. To. Be. Then we take this brilliant concept and slather it on a slice of the best bread variety I know: sourdough. Or your bread of choice (gluten-free, even!). 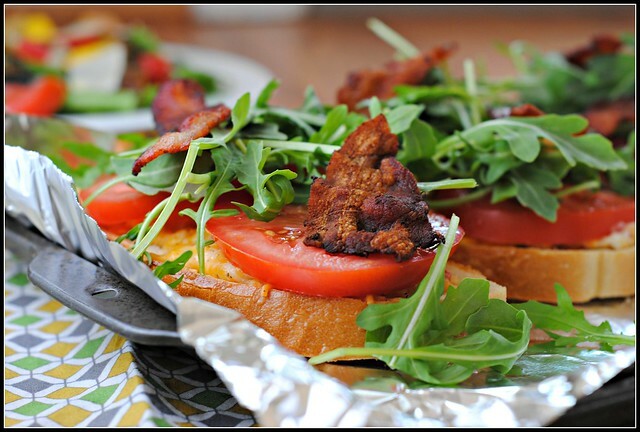 Top that with some of summer juiciest tomatoes, some crisp bacon, and a handful of arugula. 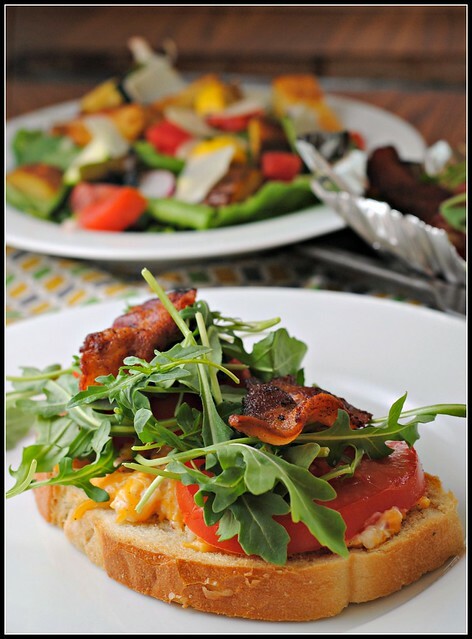 Pimento cheese meets BLT…that’s genius. And for less than 300 calories, I had to check my math three times. We’re in luck here, folks. This doesn’t push the envelope on health in the least and for that I love it all the more. The next time I get Kristen’s voicemail I’m going to get her back for arousing such envy on a Monday. I’m going to leave her a message letting her know I’m eating an Open-Faced Pimento Cheese BLT. She was lucky enough to be in town when these are made and it will surely evoke some serious emotions of jealousy when I tell her what she’s missing out on. No, it’s not the beaches of Hawaii, but these have got to be the next best thing. At least that’s what I tell myself when I’m not on the beaches of Hawaii. Preheat broiler to 500-550 F.
Combine first 7 ingredients in a large bowl. 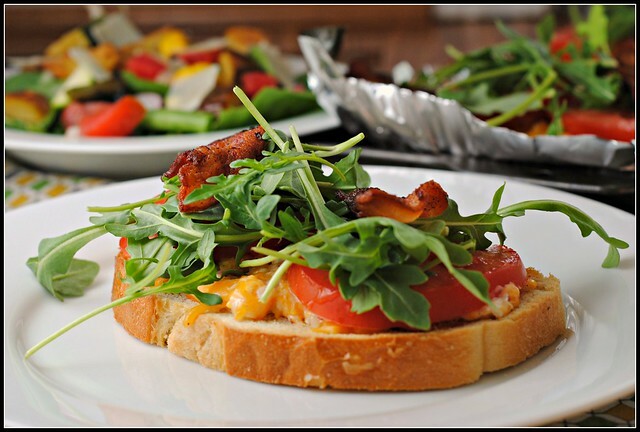 Spread 3 tablespoons cheese mixture on each bread slice and broil for 1-2 minutes or until bubbly and hot. 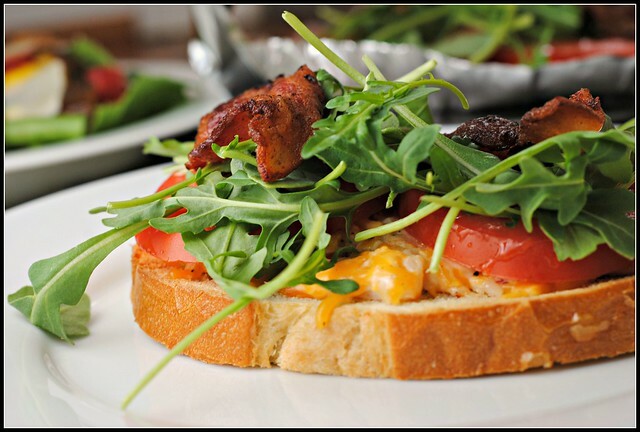 Top each BLT with 3 tomato slices, 2 bacon halves, and 1/4 cup arugula. Serve immediately. Yield: 4 servings (1 BLT each). Result: So fast, so good. 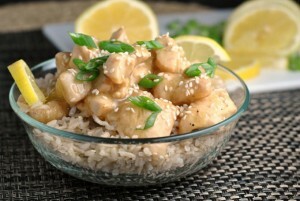 This is kid and husband-approved food that is low in cost and perfect for a light weeknight meal. We paired these sandwiches with a tossed salad that had roasted potatoes, raw green beans, radishes, and tomatoes…so good. Enjoy! Cajun Chicken Pasta was a BLOW OUT! The whole wheat variety was GONE and the feedback was a resounding, “YUM!” We actually made about 30% more than we had projected and even that was gone. Woop woop! Today is buffalo chicken salads (baked and fried). If my coworkers are anything like Mr. Prevention…this will be a hit, too! We shall see. I’ve never had pimiento cheese either! Pimento cheese rocks my world! This looks awesome! How did you go so long without pimiento cheese? It’s one of my Aunt’s favorite things to make – we could make a meal of that and crackers. But now I’ll have to make this for my hubs – he would love it. And pimiento cheese on a burger? Amaze balls! I had pimento cheese for the first time when the folks moved down south……I was highly suspect of the stuff……..the red bits of pimento threw me off. But as with most cheeses, I quickly came around! It’s a bit harder to find here, but try it on a baked potato (with bacon! )…….super YUM! Uh, I wanna come work where you work! 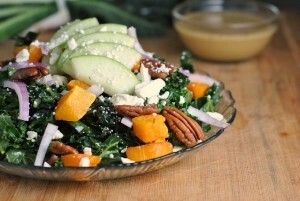 I would love if someone offered us such delicious, healthy lunch options! If I want a chance at eating healthy at work, I have to pack my lunch. Yum! Is it just me, or are open-faced sandwiches just more fun than regular ones? I’ve noticed several recipes where the bacon is uncured. I would guess the sodium would be lower but are there other reasons to use uncured bacon? Is it difficult to find? I don’t know if I ever seen it. Hi Ann! Good question! Bacon that is uncured is free of nitrates and nitrites which have been strongly linked with colon cancer. Finding uncured bacon is fairly common – you just need to look for the words “uncured” or if it says “natural” be sure to check the ingredient list. Most major retailors will carry 1-2 varieties of uncured bacon. You will clearly see nitrates or nitrites listed as an ingredient if it is cured. The role of nitrates is to prevent rancidity and to keep meat pink – they’re very much so unnecessary. Hope that helps! I’ve never had pimiento cheese before, but these do sound awesome Nicole! I love pimiento cheese! It is a Southern staple 🙂 This looks like an amazing way to eat it! I’ve been wanting to try it on a burger….that is pretty popular around here too. Sounds like the new job is going well!